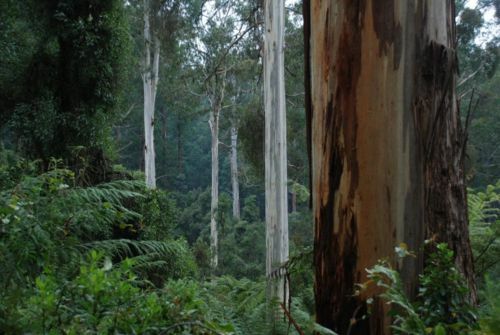 This report assesses some of the forest areas in East Gippsland that were announced for protection during the 2006 Victorian State Election campaign. The purpose of this report is to assess the quality and quantity of some of the forest areas newly protected and surrounding forests with respect to the stated aims of the Government which were to protect under the National Parks Act the last significant stands of Victoria’s old growth forests (available for logging) to enhance tourism and protect biodiversity. The three areas covered by this report are outside of the proposed new reserve system and are considered to be also all worthy of protection. The Brown Mountain region bounded by Errinundra Road to the east, Legge Road to the east and Errinundra National Park to the south contains numerous very significant old growth Mountain Ash trees with a largely intact understory. This forest area is a firm candidate for protection due to biodiversity value and age of the forest. This area should be included in the new reserve system to improve its continuity and enhance the wildlife corridor. In addition, National Park signage in this area is in need of immediate attention. The Jungle Creek catchment south of the Aberdeen Track contains significant old growth Mountain Ash trees, cool temperate rainforest plant species and wet sclerophyll forest. This area should also be included in the new reserve system to improve the continuity of the reserve and further enhance the wildlife corridor. It is imperative that fuel reduction burning of this area of forest includes measures to protect both old growth trees and the wet sclerophyll forest. Heavily logged forests along both the Mount Jersey and Yalmy Roads and the Rodger River Track detract from the visual characteristics of this region due to loss of forest canopy and large amounts of logging residue. In addition, regrowth areas will have little appeal or habitat value for many decades. This has a major negative impact on tourism potential. Logging activities in these areas should cease – they should be added to the National Park estate. Some significant forest areas of high quality along the Yalmy Road adjacent to the Snowy River National Park have been newly protected. However, other adjacent areas of equivalent forest have not been afforded any protection. This indicates apparent inconsistencies in the decision making process regarding the selection of areas for protection. An impressive stand of old growth Mountain Ash with very high visual appeal is located on the Yalmy Road close to the intersection with the Rodger River track. Mountain Ash (Eucalyptus regnans) is comparatively unusual in East Gippsland. While sections of this forest have been logged, the overall impression is of majestic trees. The rationale for excluding this area from the new protected reserves is not clear. 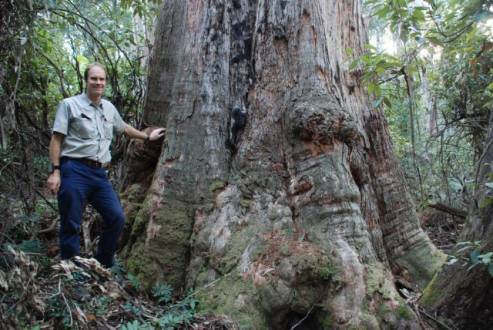 It should be also be added to the reserve system both to protect the remaining old growth trees it contains, and to boost and improve the integrity of the adjacent Snowy River National Park. While additional areas of old growth forest have been specified for protection in East Gippsland, there are good opportunities to further add remaining unprotected old growth and wet sclerophyll forest to the reserve system for the intrinsic value of these forests, to create a more robust wildlife corridor link between the Errinundra and Snowy River National Parks and to protect resident endangered species. This report assesses some of the forest areas about to be protected that were announced during the 2006 Victorian State Election campaign. Material and photographs for this report were gathered during a visit to East Gippsland forests in the Goongerah region on 14 – 16 April 2007. The purpose of this report is to assess the quality and quantity of some of the forest areas newly protected and surrounding forests. I would like to thank Jill Redwood for her assistance and advice during my visit to East Gippsland to gather material for this report. Immediately protect the Goolengook Block and the last significant stands of Victoria’s old growth forests currently available for logging under the National Parks Act. In total this will add almost 33,500 hectares of forest to the National Parks and reserve system. Create the Great Victorian Alpine National Park by adding a 5000 hectare section of State Forest currently available for logging to link the Errinundra National Park to the Snowy River and Alpine National Parks and pursue World Heritage Listing of a Great Alpine National Park in partnership with the ACT and NSW. 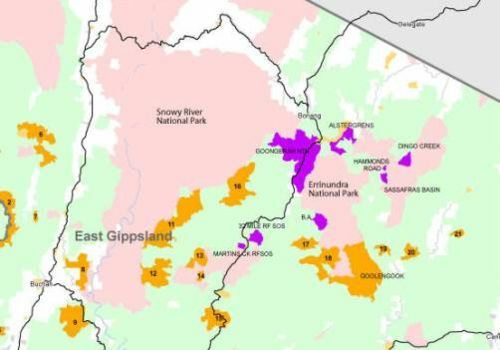 Immediately add 2,500 hectares of icon State Forest in East Gippsland currently available for logging to the National Parks and reserve system." The investigation by the Victorian Environment and Assessment Council (VEAC) into the Goolengook block would cease as the block will be permanently protected. 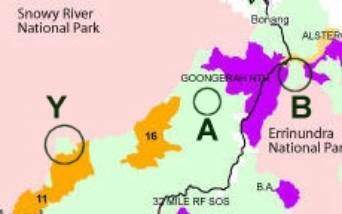 In addition to the Goolengook Block remaining significant stands of old growth forest currently available for timber harvesting will be immediately protect by including them in the National Parks and reserves system. It doesn’t make sense from an environmental or commercial perspective to allow the few remaining large stands of old growth forests to be logged. In addition to their visual majesty, old growth forests are rich sources of biodiversity and habitat to a range of species. The benefits for tourism, and market access opportunities for the timber industry from protecting the remaining significant old growth timber stands, clearly outweigh the on going minimal returns from the harvesting of old growth forest. Source: Labor protects last significant old growth stands, 17 November 2006. The fact sheet also contained a map of proposed new parks and reserves in East Gippsland (see Appendix 4 for a larger version of this map). My interest in visiting East Gippsland was to assess the quantity and quality of the new proposed parks and reserves. I chose to visit three main areas that were either adjacent to outside of the proposed new reserve areas identified on this map. The areas I chose to visit and their regional location are depicted in Map 1. These areas are shown in more detail in Map 2 below. The three areas visited overlaid on the protected areas map provided by the government are illustrated in Map 3. Each of these three areas are outside of the announced new proposed reserve areas and will be covered in more detail in the following sections, with photographs provided. The Brown Mountain area visited was to the east of Legge Road just South of part of the Errinundra National Park. This area contains numerous very large old growth Mountain Ash trees with an intact understory. This forest area is a firm candidate for protection due to value and age of the forest, yet it has been omitted from the proposed new reserve area. The Brown Mountain region bounded by Errinundra Road to the east, Legge Road to the east and Errinundra National Park to the south contains numerous very significant old growth Mountain Ash trees with a largely intact understory. This area should be included in the new reserve system to improve the continuity of the reserve and enhance the wildlife corridor. Gramps tree base, Brown Mt, WP009. Unprotected old growth. A prime candidate for protection. Brown Mountain, WP006. Old growth eucalypt, unprotected. Obvious candidate forest for protection. Brown Mountain, WP006 Fox baiting warning sign for buried fox baits. Errinundra NP, Brown Mountain, WP006. Adjacent to equivalent unprotected forest. This protected forest has equivalent characteristics to the adjacent unprotected forest. Errinundra NP, Brown Mountain, WP006. National Park signage in disrepair This part of the national park is suffering from neglect. The characteristics of the forest would encourage visitors, but the lack of signage and information is an obvious barrier to visitors. Errinundra NP, Brown Mountain, WP006. Newly protected old growth. 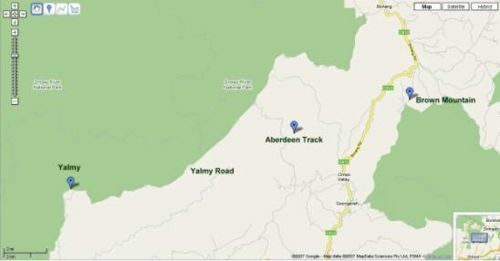 The Aberdeen Track traverses a ridge above the Jungle Creek catchment to the north west of Goongerah. This area is outside the new reserve system announced. A fuel reduction burn was scheduled and signed for Autumn 2007 season. I spoke with the Bendoc Department of Sustainability and Environment office and was informed that these burns were required as part of the fire management plan to protect local residents and to protect the ecological integrity of the forest. I queried whether any management plans were in place to protect high conservation value parts of this forest area, specifically the cool temperate rainforest gullies the would suffer greatly from burning, and was informed that no special measures were to be taken in the regard. Areas of forest in the Jungle Creek catchment below the Aberdeen Track contain significant old growth Mountain Ash trees, cool temperate rainforest plant species and wet sclerophyll forest. Fuel reduction burning of this area of forest should include measures to protect old growth trees and wet sclerophyll forest. Fern understory and some moist cool temperate rainforest species present. Candidate for protection. Wet sclerophyll and old growth eucalypt forest. Tree fern, Unprotected wet sclerophyll forest. The Mount Jersey Road heads northeast through heavily logged forests to join the Yalmy Road. 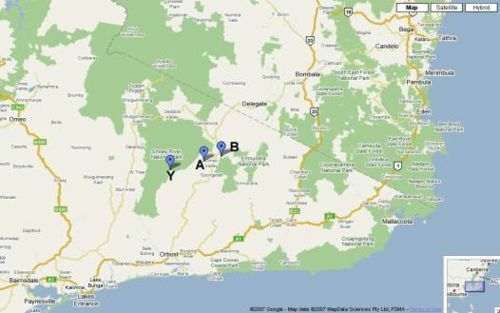 The Yalmy Road travels along the boundary of the Snowy River National Park (to the north west) and unprotected Yalmy forests (to the south east), many of which have been heavily logged. 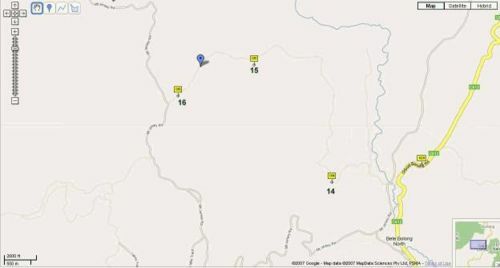 Two prominent logged areas were visited on the Mt Jersey Road, numbers 17 and 18 in map 7. Photographs of these areas follow. Significant logging activity has occurred in the forests along both the Mount Jersey and Yalmy Roads. This logging has resulted in the clearfell destruction of forests, which has detracted greatly from the value of these forests for both tourism and their biodiversity and habit value. The Yalmy forests are of equivalent biological value to those of the adjacent Snowy River National Park. Remains of previous forest being left to rot and loss of the forest canopy have a very high visual impact. Logging activities in these areas should cease. 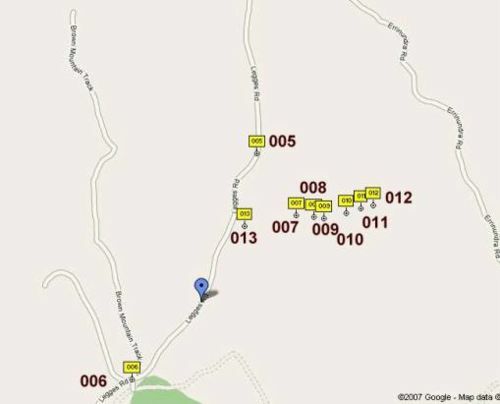 These areas should be added to the National Park estate. Some significant areas of high quality have been newly protected. However, adjacent areas of equivalent forest have not been afforded any protection. This indicates apparent inconsistencies in the decision making process regarding the selection of areas for protection. Near the junction of the Yalmy Road and the Rodger River track, an entire segment of forest depicted as the “bulge” in Map 8 and covering waypoints 24, 25 and 26, has been omitted from the new reserves. This area of forest contains large stands of eucalyptus regnans (Mountain Ash) trees of considerable age and visual appeal. This species is comparatively unusual in East Gippsland. While sections of this forest have been logged, the overall impression is of majestic trees. The rationale for excluding this area from the new protected reserves is not clear. The “bulge” should be added to the reserve system both to protect the remaining old growth trees it contains, and to provide a contiguous corridor for wildlife. Significant logging activity is evident adjacent to the Yalmy Road and Rodger River track junction and along the Rodger River track up to the boundary with the Snowy River National Park. This logging is characterised by large areas of clearfelling, many dead habitat trees and the loss of high quality forest. From the summit of the knoll (WP028) logged skylines are visible in the distance in the Yalmy forests. This is a clear breach of the Code of Forest practice, which stipulates this practice is not permitted. The loss of biodiversity is evident in these logged areas too. Wattle regrowth often crowds out most other species, and little habitat is left for possums, owls, quolls and other animals that need them. A re-elected Labor Government will immediately protect the remaining significant stands of old growth forest in Victoria, including the Goolengook Block, by adding them to the National Parks system. This will add another 33,500 hectares of State Forest currently available to the timber industry to the National Park system. In 2002 the Bracks Labor Government placed a moratorium on logging in the Goolengook Block in East Gippsland pending the outcome of an investigation by the Victorian Environment and Assessment Council (VEAC). The Goolengook Block contains substantial areas of rainforest and old growth forest, long footed potoroo and other threatened species habitat. As the Goolengook Block can be permanently protected under the National Parks Act without any adverse impact on volumes available to the timber industry, a Labor Government will immediately wind up the VEAC investigation and protect the Goolengook Block in the National Parks system. While over half a million hectares of old growth forest is already protected in reserves and National Parks in Victoria, it doesn’t make sense from an environmental or commercial perspective to allow the few remaining large stands of old growth forests to be logged. In addition to their visual majesty, old growth forests are rich sources of biodiversity and habitat to a range of species. This page was last modified 12:17, 14 October 2012.